I don't know if you would file this one under irony or coincidence, but Bobcat Goldthwait's 2013 film Willow Creek was a "found footage" movie which concerned a couple who was hunting for Bigfoot. Structure-wise, the movie played almost like a remake of The Blair Witch Project, but it made the mistake of containing no Bigfoot at all. Now, The Blair Witch Project Director Eduardo Sanchez has returned with another "found footage" entry, entitled Exists, which is also about Bigfoot. Fortunately for us, Sanchez has remembered to bring the Bigfoot with him. Exists opens by introducing us to Matt (Samuel Davis), his brother, Brian (Chris Osborn), Matt's girlfriend, Dora (Dora Madison Burge), Elizabeth (Denise Williamson), and her boyfriend, Todd (Roger Edwards). This group is traveling to a cabin owned by the uncle of Matt and Brian. The cabin lies in a rural Texas forest, and the group plans to spend the weekend relaxing and making videos of the bike stunts. When they arrive, they find the cabin to be in disrepair, and the brothers report that their uncle hasn't been there in years, but they don't know why. After a day of fun, strange noises can be heard at night. Soon, the group begins to suspect that something in the forest is stalking them. As there is no cell phone reception (natch), Matt volunteers to go for help. His trip will trigger an attack by a large hairy creature which has big feet and a knack for violence. When I got Exists to review, I told my wife and a female friend, and they both had similar reactions which can be boiled down to, "What wants to see a Bigfoot movie?" Why, me, that's who. I came of age during a time with cryptozoology was a big deal and Bigfoot was found throughout the media. Who could forget that The Six Million Dollar Man fought Bigfoot. During that time, movies like The Legend of Boggy Creek appeared, but I don't think that we've ever gotten the definitive Bigfoot movie. 1980's Night of the Demon tried to do something different, but that film is now known for being infamous, not for being good. 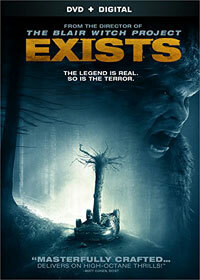 Exists is not the definitive Bigfoot movie, but it's pretty good and it does do some things right. First and foremost, there is some Bigfoot in this Bigfoot movie. We don't get a really good look at the creature until the very end (natch), but the monster appears throughout the movie. This is not a curious creature who suddenly turns violent. From the outset, Bigfoot does not like these interlopers being in his woods (and for good reason), and we quickly learn why Uncle Bob (J.P. Schwan) never visits the cabin. The attack scenes are well done and we really sense the ferocity of the creature. The movie doesn't have much in the way of plot, but once the character's realize what is happening, their behavior is fairly believable for a horror movie. I have two problems with Exists and these issues go out to the horror movie world in general. First of all, Eduardo Sanchez has got to let go of the "found footage" genre. Yes, The Blair Witch Project put him on the map and he should be eternally grateful to it, but it's time for him to movie onto something else. Even his movies which aren't "found footage", such as Lovely Molly, still manage to include handheld camcorder footage. While Exists has its moments, I think that the movie would have worked much better as a regular narrative. It certainly would have meant losing the scene in which Brian shows us all of the GoPro cameras which he brought. The other issue with the movie are the characters. While they aren't as annoying as some other "group goes on a trip and something bad happens" inhabitants, they still aren't very appealing. Why don't filmmakers understand that if we don't care about the characters, we don't care about the characters! No, Exists isn't perfect, but it's one of the best entries in a criminally under-represented sub-genre of horror. The Bigfoot creature looks good, there is a great deal of energy in the attack scenes, and the movie doesn't pull any punches. While the movie suffers from the constraints of the "found footage" genre, there is one very memorable shot of the creature leaping from a cliff. While we wait for the perfect Bigfoot movie, Exists will suffice as something for you and your Sasquatch to do on a Saturday night. Exists shows that you can't trust your traveling companions on DVD courtesy of Lionsgate. The film has been letterboxed at 1.78:1 and the transfer has been enhanced for 16 x 9 TVs. The image is sharp and clear, showing only the defects which are inherent with "found footage" films, namely static, rolling, screens, or freezing images. The picture has a nice crispness to it and it's rarely soft. The colors look good, but some of the nighttime shots are notably dark. The DVD carries a Dolby Digital 5.1 track which provides clear dialogue and sound effects. The stereo and surround effects are notably good and they do a nice job of alerting us to sounds which are coming from off-screen or behind the characters. The subwoofer effects accentuate the creature's roars and its attacks on structures. The Exists DVD contains several extras. We begin with an AUDIO COMMENTARY from Director Eduardo Sanchez and Writer Jamie Nash. The DVD contains six DELETED SCENES which offer no "Play All" option. These include an Alternate Opening (which simply feels longer) and an Alternate Ending, (which didn't seem any different). There is also a pos-credit scene which was cut. "21 Days in the Woods: Behind the Scenes of Exists" (30 minutes) is a three-part featurette which takes us on location to show the rigors of all of the exterior shooting involved in the film. This includes "fly on the wall" observations of the cast and crew at work, as well as comments from various personnel involved in the movie. Occasionally, someone will describe what we are seeing. We also get a good look at the Bigfoot suit. "Bringing Bigfoot to Life" (10 minutes) has Sanchez narrating a piece which documents how the design of the creature evolved and how WETA was initially involved in what the monster would look like.